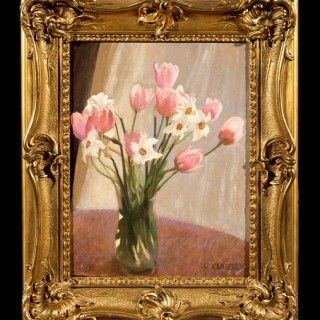 During the 1900’s, Clausen became increasingly interested in still-life painting and specifically in flower-pieces. These works had the theme of growth and decay that he had experienced when working en plein air, in the fields. In this painting, the soft pink and lively yellow- green colours are reminiscent of an English Spring. When his retrospective exhibition was staged at Barbizon House in 1928, over a quarter of the paintings were flower pieces, a testimony to his love of the subject. 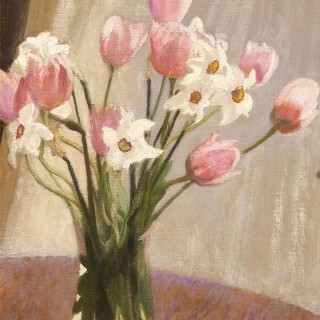 Flower paintings such as Tulips & Narcissi in a Glass Vase became a genre that Clausen helped to re-invent for a new generation of collectors in the 1930s. As seen in this painting, Clausen always insisted on simplicity. Daisies, tulips, or narcissi pulled from the garden and placed in a glass jar were sufficient to catch the eye. Beauty, he had always insisted, must be found in simple things.